Take the rice flour, ragi flour and wheat flour in 3 separate bowls and add a pinch of salt in each bowl. Add water little by little in each bowl and mix well with hand without any lumps till it becomes wet/ moist. Keep it aside. Take a puttu maker and add 1 tbsp of grated coconut first, then add the wheat flour followed by rice flour and then finally layer with ragi flour. Sprinkle some grated coconut on top. Repeat the process till the puttu maker is filled. 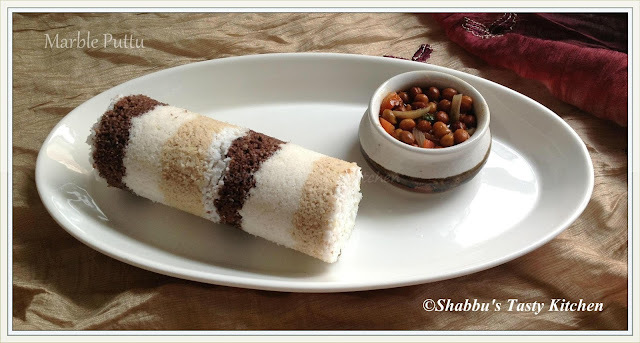 Hi, Puttu is really looks great...Very excited to see a new design in breakfast galleries.